I’m an Industrial Engineer, master in Mechanics – Construction from the Universidad Politécnica de Madrid. My career started working in projects related to information and communication technologies. I’m working in NH Hotel Group since 2005, performing different roles in the Engineering & Maintenance area. I have been responsible for Maintenance of a Region, first in the East Area and then in the Central Area of Spain. 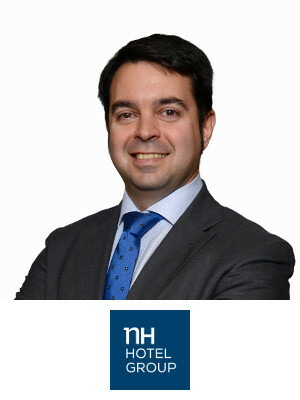 In 2012 I started working in the Headquarters of NH Hotel Group, leading the Maintenance and Engineering area since October of the said year. We are in charge of the development of Engineering standards for the brands (NH Hotels, NH Collection, NHOW and Hesperia), and I have participated actively in the installations renovation of the assets repositioning plan. NH Hotel Group is very proactive working in sustainability, and from the Engineering department we are in charge of the control of the energy accounts and the energy efficiency implementation (renewable energies, use of new technologies to reduce energy consumptions, energy saving, etc.). I also built up the new energy procurement strategy and leaded the implementation of the maintenance management software, bringing the maintenance activity to a modern approach in line with the digital transformation of the Company, and promoting the relevance of the maintenance activity. Recently I have been appointed Vice President Maintenance and Engineering.